On 2 May 2013, carbon dioxide (CO2) levels in the atmosphere reached 400 parts-per-million (ppm) for the first time in human history. This record was measured by the NOAA/ESRL's Global Monitoring Division in Mauna Loa, Hawaii. The daily average for 9 May 2013 was an alarming 400.03 ppm. When measurements started in 1958, the daily average was around 315 ppm, already a much higher level than the pre-industrial average of 280 ppm. CO2 is the main driver of global warming, climate change and ocean acidification. Its emissions have significantly increased due to human activities such as deforestation and burning of fossil fuels. Charles David Keeling first started measuring CO2 concentrations in the atmosphere at the Mauna Loa Observatory in 1958. The atmospheric CO2 concentrations are increasing at a faster pace. In just the last ten years, the rate of increase of the atmospheric concentration of CO2 has risen from 0.7 ppm per year to 2.1 ppm per year. Analysis of air bubbles trapped in ancient ice shows that the level reached last week (400 ppm) has not been seen on Earth for 3-5 million years. 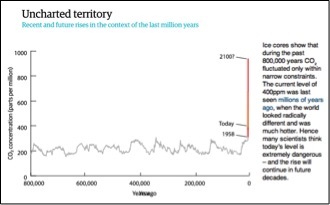 At that time, temperatures were 3-4°C higher than today, coral reefs suffered major extinction and the Arctic had no ice, but was covered by forests. Experts claim that CO2 levels in the atmosphere must be stabilized at 450 ppm to avoid the worst impacts of climate change. Others argue for a more ambitious goal of 350 ppm. However, NOAA has not recorded a monthly average below 350 ppm since 1988. Humans are changing the Earth’s climate and affecting all ecosystems in an unprecedented way, with a whole range of negative consequences. Emissions reduction, efficient use of energy and a lower dependence on coal and oil are necessary steps that should be taken together by industry and governmental bodies to mitigate these changes.